The offshore oilfield developer is burning through cash. 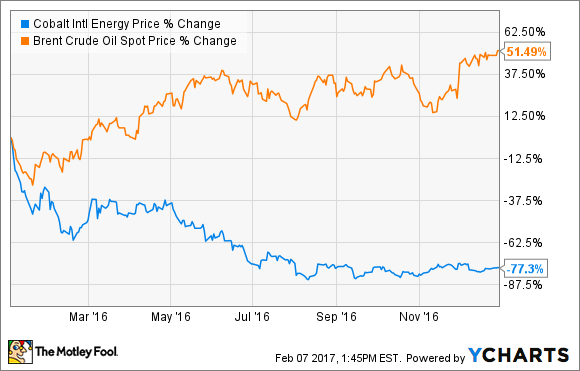 For most oil companies, 2016 was the year they finally got their mojo back. While crude prices continued crashing through the first couple of months, oil would go on to rebound sharply off the bottom, ending the year up more than 50%. That rebound in the oil market was all the fuel most oil stocks needed last year, as many rallied as much as (if not more than) the price of crude. Here's what went wrong and why things might not get much better in 2017. Cobalt International Energy is not like most other oil companies. Until last January, it had never produced a drop of oil in its history. Instead, the company spent the first decade of its existence raising capital from outside investors to finance deepwater exploration and development, which is both expensive and time-consuming. However, the company started a new chapter in its history last year when Anadarko Petroleum's (NYSE:APC) Heidelberg project delivered first oil in mid-January, which is a facility that Cobalt owns a 9.375% stake. That production was a long time coming considering that Anadarko discovered Heidelberg in 2009 and began constructing the multibillion dollar production platform in 2013 before finally producing oil last year. While Heidelberg has performed as expected, it only supplied Cobalt with $13.7 million in cash flow from operations through the first nine months of the year. That barely put a dent in the nearly $775 million the company expected to spend in the Gulf of Mexico last year to fund its continuing operations nor the up to $140 million it needed to support development activities at its properties in Angola. As a result, those investments consumed nearly half of its cash position last year, leaving the company with just $683 million in cash at the end of the third quarter, down from $1.2 billion to start the year. On a positive note, that capital enabled the company to drill additional test wells, resulting in the confirmation of oil and gas at several promising prospects. For example, Cobalt's Shenandoah prospect continues to strike oil, with the company completing its fourth successful test last year. However, not every well paid off; the Goodfellow No. 1 exploration well came up dry, forcing Cobalt and its partner Total (NYSE:TOT) to abandon the prospect. That dry hole cost Cobalt its entire $149.9 million investment. Given the high costs of developing offshore fields, the company had hoped to boost its cash position by agreeing to sell its Angolan assets in 2015 for $1.75 billion. However, that deal fell through last year, putting the company in a tight spot financially as it continued to burn through cash. Because of that, Cobalt had no choice but to obtain high-cost funding so it could have a bit more breathing room. Towards the end of the year, the company completed a debt exchange and financing transaction that raised $500 million of liquidity and pushed out half of its $1.38 billion in debt by four years. To sweeten the deal, Cobalt offered creditors 30 million shares of its common stock, which diluted existing shareholders by 7%. While last year's debt transaction bought Cobalt some time, the fact of the matter is that it is still running low on cash. That is why the company is actively marketing its Angolan assets. However, these assets have been on the market for quite some time, which suggests the company has not received any acceptable offers. Because of that, even when it does find a buyer, it seems unlikely to sell the assets for anything close to what the previous buyer had agreed to pay. That said, if the company does find a buyer willing to pay more than the market expects, it could fuel a major rally in the stock. However, any asset sale would still just be a band-aid for Cobalt because it is not even close to the point where its operations can sustain development projects. Because of that, the company will need to continue seeking outside capital to finance expansion. That cash could come from additional asset sales, more debt, or further dilution. Unfortunately, not one option is very palatable at the moment given the current market environment. Asset sales will not fetch full value until oil prices are much higher. Meanwhile, future debt or dilution are not appealing given the sky-high costs. That said, at some point, the company has to do something so that it does not run out of money. The concern is that like last year, desperate times could call for desperate measures, such as a significant equity offering that could further dilute existing investors and crush the stock price. Cobalt International Energy's expenses far outstrip its cash flow, which is a dangerous way to run an oil company. At its current spending rate, the company has about a year's worth of cash left, which obviously isn't enough. Needless to say, the company needs to do something to shore up its balance sheet. That likely means more debt or dilution could be on the way, which depending on the terms, might not sit well with the market and could potentially cause a deep sell-off in the stock.